BuzzFeed News spoke to four people who organized black rights protests and taught self-defense classes after being contacted by Russian trolls pretending to be US activists. Russia’s most infamous troll farm recruited US activists to help stage protests and organize self-defense classes in black communities as part of an effort to sow divisions in US society ahead of the 2016 election and well into 2017. Four people contacted by what is believed to be the “American Department” of the St. Petersburg-based Internet Research Agency told BuzzFeed News that while they found their contacts strange, they never suspected that they were the target of foreign recruitment. The operation, including the names of the activists, was first reported by Russian news outlet RBC in a major investigation published Tuesday. One target was Micah White, a cofounder of Occupy Wall Street. When he was contacted in May 2016 by a man named Yan Big Davis, who presented himself as a freelance reporter, he didn’t think anything of it, since he often gave interviews about activism. 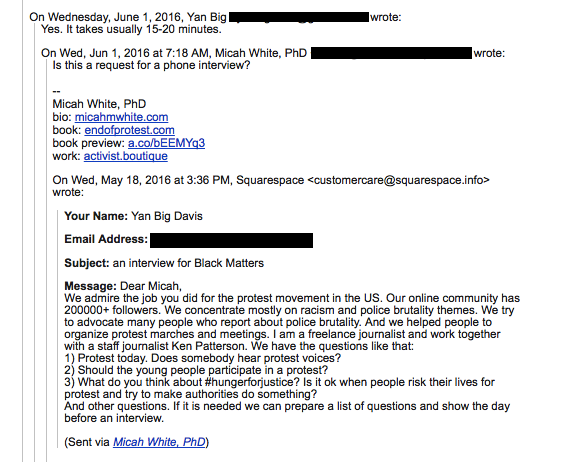 According to emails seen by BuzzFeed News, Davis said he was writing for a site called BlackMattersUS, which had over 200,000 followers and focused “mostly on racism and police brutality themes.” In its report, based on interviews with current and former employees of the troll farm as well as a source close to its leadership and internal documents, RBC found that BlackMattersUS was linked to the Internet Research Agency. The BlackMatters site, which is still up, features awkward language throughout. Its contact page tells those who would reach out, “You are exactly that person, who can help us to figure out not only the top stories, but also the events that are really important to an ordinary African-American.” The group did not immediately respond to a BuzzFeed News request for comment. Although the group’s main site is still live, its Twitter, Instagram, and Facebook accounts have been suspended. RBC said Facebook suspended the group’s account as part of a purge of 470 accounts run by the Internet Research Agency. Andy Stone, a Facebook spokesperson, told BuzzFeed News he was "not able to confirm" that the groups were suspended as part of the purge. Davis wrote to White requesting an interview. “We admire the job you did for the protest movement in the US,” he wrote in an email seen by BuzzFeed News. When they spoke on the phone the following month, White said the connection sounded as if Davis was calling from a long distance. His accent sounded strange. He assumed he was probably speaking to an African man. “The idea that he was a Russian was the furthest thing from my mind,” White told BuzzFeed News. The questions Davis asked him in the interview also sounded different to him than the questions he routinely gets from reporters. White didn’t respond. “I support MOVE but it’s also outside of the normal concerns for black activists I would say,” he told BuzzFeed News. The following month, Davis emailed him again asking him to share information with his “audience”about the case of Jerome Skee Smith, an African-American convicted of a murder he says he didn’t commit. “It is really the case when only simple sharing can save his life,” Davis wrote to him. White also didn’t respond. Davis emailed him one final time to tell him that the trial had been pushed back and to ask again that he share the information with his audience. “Thank you for being a part of this. Together, we are creating history,” Davis wrote to him. An email sent to the address for Davis that corresponded with White went unanswered. BlackMattersUS also contacted other activists such as Conrad James, who runs a nonprofit based in Raleigh, North Carolina called Living Ultra-Violet. James told BuzzFeed News that BlackMattersUS reached out with a message from its Facebook page, rather than from an individual member, asking him to speak at a rally in September 2016 after the death of Keith Lamont Scott, a black man who was shot by police in Charlotte. James said that when he found out there was no organizer for the event, he offered to organize the rally himself and was told by the page’s manager to contact a woman named Stephanie Williamson, who he described to BuzzFeed News as a spokeswoman. While James said he found this odd, the only other detail that struck him as strange was a white man who he said accompanied Williamson and never said a word or smiled. Other things checked out, however. Williamson gave him a bank card to pay for expenses such as microphones and speakers, James said. And the permits for the event appeared to be in order. James said he also organized a second, larger rally in October for BlackMattersUS that took place in tandem with a national set of protests organized by the NAACP, the ACLU, and other groups. BuzzFeed News could not immediately track down Williamson. A video hosted by the Black Matters YouTube account is titled “Stephanie Williamson at BM Charlotte protest.” James says that he no longer has Williamson’s contact information. It’s unclear whether Williamson was herself tricked into participating. James said he didn’t find out that the group was linked to a Russian troll farm until he was contacted by reporters from RBC a few weeks ago. The troll farm was also linked to a group called Black Fist, according to RBC. Black Fist’s site says that the group teaches black communities self-defense, or as the Black Fist site put it, "organized by black for black." The website is still up, though its Facebook and Instagram accounts have been suspended. The group did not immediately respond to a BuzzFeed News request for comment sent to the email address provided on its page. Facebook also declined to comment on Black Fist’s page being taken down. "Be ready to protect your rights," the site reads. "Let them know that Black Power Matters." Adewale, in an interview with BuzzFeed News between personal training clients, said that he was first contacted by the man he knew as "Taylor" via his Instagram in January 2017, to teach four self-defense classes a month. Though he was initially wary, his concerns dropped once the first of the payments came through — $320 per month. Adewale, like White, described the man with whom he spoke over the phone but never met, as having "an accent from the African continent." "I'm thinking there is a sense he wanted to do something for the community, get this aptitude for self-defense, and I'm thinking someone else is handling education somewhere else, other community issues as well," he said. "We never talked about that." The classes weren't hugely attended when they started in March — at most, a dozen people, Adewale recalled. Sometimes nobody would show up at all. But attendance started to rise as "Taylor" began paying for Facebook ads and other promotions to get more people to show up in Queens, then in added sessions in Brooklyn, Adewale said. Soon there were two classes a week. Adewale said he was instructed by Taylor to take pictures and video of the sessions. He never spoke with any of the other four trainers listed on the site, he says, but became suspicious again when the people paying him began having trouble with Google Wallet, insisting that he switch to using PayPal. That, combined with the fact that the group never discussed the politics that had drawn him in, caused Adewale to be leery. "When I started to ask questions, that's when they had somebody who wanted to train with me, so they could start their own class," Adewale said, but that person was a martial arts novice, an oddity for a self-defense class. According to Adewale, Taylor soon stopped contacting him altogether. The classes stopped in May. But Adewale said he didn’t realize that the situation was connected to Russia until recent reports began to connect Russian efforts to sway the election through Facebook, Twitter, and — in particular — targeting black organizers. "The whole time I thought this was something they made up at the DNC," he said about the reported Russian interference in the election. "But they didn't contact me during the election, so what I'm getting from media outlets is that they're making it seem like it's just for the election. It was in January they contacted me." Adewale said that Google has been in touch with him since May to discuss the security of the company's products. "I think they were using everything they could, and when they could no longer use those resources, when they were being found out, then they were shutting everything down," he said. Rosalind Adams is world correspondent for BuzzFeed News and is based in Hong Kong, China. Contact Rosalind Adams at rosalind.adams@buzzfeed.com.